The Ergo-Q is simply the most portable, ingeniously engineered notebook stand available. 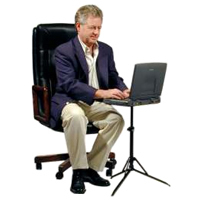 The Ergo-Q allows 5 different positions, offering over 5" (12.7 cm) of height adjustment. The Ergo-Q has a patented inline document holder, which conveniently positions documents just below the laptop screen to minimize undue head and neck motion. It is ultra mobile, lightweight and effortlessly fits in any notebook case - only 0.4" (0.9 cm) thick when folded for transport! Compare all the Bakker-Elkhuizen Products Here. 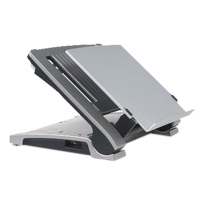 The Ergo-T340 is a versatile office notebook stand which provides an impressive array of features and capabilities as a docking station. 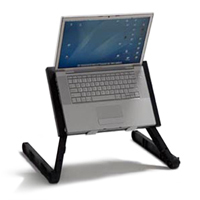 It is a stable, durable and secure laptop stand providing an impressive 7" of height adjustment to ensure that once the laptop is docked, the screen can be adjusted to the optimal height. 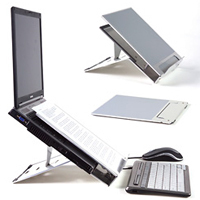 The unit has a swivel base, integrated cable management, laptop cooling sleeves, a fold up inline document holder and is easily secured with a single computer cable lock. An optional unique universal housing accessory (Port Replicator Module - PRM) integrates any port replicator (docking station) or USB hub to pre-connect all peripherals, making it ideal for the power user who requires quick connectivity. The LYNX Tablet/Laptop Stand from ErgoVerse is a light-weight, portable tablet/laptop stand with a built-in USB fan for cooling the tablet or laptop while in use. Its ultra-thin design of aluminum alloy panels helps dissipate heat while providing a durable and stable surface. The back of the unit can also store the USB cable (included) and also flash drives (not included) within their own hidden compartments, so that the user can easily transport everything in one compact device. There are 6 angled adjustments from 0° to 44° for any tablet or laptop up to 17", so that the screen can be raised or lowered to the appropriate ergonomic height while viewing. The LYNX stand also comes with its own padded storage sleeve to protect it when not in use or while traveling. Le LYNX Tablet/Laptop Stand d' ErgoVerse est un support de tablette / ordinateur portatif léger et portatif avec un ventilateur USB intégré (câble USB inclus) pour refroidir la tablette ou l'ordinateur portable pendant son utilisation. Les charactéristiques des panneaux ultra-mince fait en aluminium allié aide à disperser la chaleur en même temps qu`il fournit une surface durable et stable. L'arrière de l'unité peut également ranger le câble USB pour le ventilateur(inclus) et également les lecteurs flash (pas inclus) dans leurs propres compartiments cachés, de sorte que l'utilisateur peut facilement transporter tout dans un appareil compact. Il y a 6 ajustements angulaires de 0 ° à 44 ° pour n'importe quelle tablette ou ordinateur portable jusqu'à 17po, de sorte que l'écran peut être élevé ou abaissé à la hauteur ergonomique appropriée tout en regardant. Le support LYNX vient également avec son propre pochette pour le protéger lorsqu'il n'est pas utilisé ou en voyage. The Ergo-Q 330 is a more economical version of the industry standard Ergo-Q made of ABS Plastic instead of Sandwich Aluminum (Hylite). 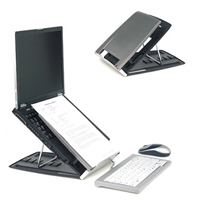 The built-in (patented) document holder, is pivotable providing access to the laptop keyboard. The range of height adjustment is just over 3". Lightweight, sturdy and adjustable, the Goldtouch Go! 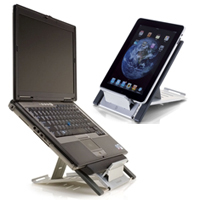 Travel Laptop and Tablet Stand allows mobile professionals to improve the ergonomics of a hotel desk, or a table in a convention centre, restaurant or coffee shop. 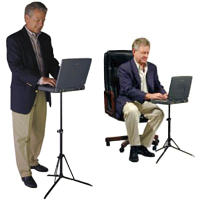 Placing a hand-held device or portable computer on the stand allows users to raise the screen to create a healthy alignment of the shoulders, neck and head. The stand has six angle settings to choose from, weighs only a pound, and has a space-saving footprint of only 10" by 10.5". It can be folded completely flat and transported in its own neoprene cover. The Goldtouch Go! Travel Laptop and Tablet Stand is made of aluminum for strength and stability, and features expandable sides that allow it to accommodate laptop computers up to 17" wide. A non-slip shelf measuring 4.25" by 2" provides a secure base beneath the device. Léger, robuste, et ajustable, Goldtouch Go! Travel Laptop and Tablet Stand permet les proffessionels en voyagent d`améliorer l`ergonomie d`un bureau à l`hôtel, ou une table dans un centre de conférence, restaurant ou café. En placant un ordinateur portable ou un appareil portatif sur le support, cela permet l`utilisateur d`élever le moniteur pour aligner en bonne santé les épaules, le cou et la tête. Le support peut être configurer en six angles, pèse seulement un livre, et prend seulement un peut d`espace de 10 po par 10.5 po. Il peut être plier complètement plat et transporter dans son propre pochète en néoprène. Le Goldtouch Go! Travel Laptop and Tablet Stand est construit en aluminum pour être robuste et stable. Les caractéristiques sont des côtés qui peuvent agrandir pour s`adapter aux ordinateurs portables de jusqu`à 17 po de largeur. Aussi, une étagère non glissant mésurant 4.25 po par 2 po offre une base sécure dessous l`appareil. The portable Lapboard Multi-Function Laptop Cooling Station from Aidata conveniently combines the functions of a lapboard laptop holder with the capabilities of a fully functional desktop laptop stand. The padded mesh fabric base provides comfort for use when travelling or at home but is easily removed for office desk deployment. 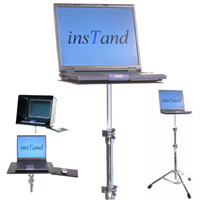 Four angle adjustments (15°, 20°, 25°, & 30°) offer screen elevation to assist in reducing neck bending during desktop use. The USB-powered cooling fan dissipates heat from the laptop, reducing strain on the processor and further increasing comfort for lap use. To improve ergonomics when being used as a lapboard holder the detachable mouse platform can be deployed for either right or left use. Rubber grip strips on the base and front ledge ensure that laptops remain securely positioned for both lap and desktop use, even at angled elevations. 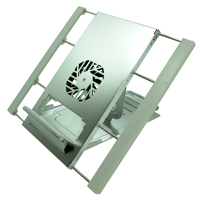 The Lapboard Multi-function Laptop Cooling Station will accommodate 12" - 17" laptops up to 11 lbs. 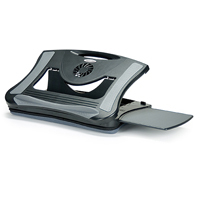 The integrated carrying handle and lightweight (under 4 lbs) design makes transporting the entire unit or just the desktop stand portion practically effortless. The CR5 Heavy-Duty Laptop Stand from Carliss is an ideal laptop stand for application where sturdiness and durability are essential. The CR5 is made of highly polished chrome plated steel. Much heavier than the both the CR1 and CR3 Instand laptop stands, the CR5 weighs in at 8 lbs. Because it is strong and stable, it can be used outdoors, indoors, in industrial settings, or in hospitals. It is also attractive enough to use on stage or in the courtroom, and is often purchased by golf and sports professionals for "sports analysis" photography. Other configurations of the CR5 model include the SuperStand with Mouse Shelf model (SS-MS) and SuperStand with Mouse Shelf and Hood model (SS-MS-H). Both SuperStand models have all the features of the CR5 but also have a 12.0" x 18.0" Polyethylene Tray for extra strength, and a swing-out Mouse Shelf and/or Hood to protect you laptop from the elements or excessive lighting. All InsTands include a sturdy tripod, a tray which fits all laptops and a leatherette carry bag. by Laidback We 'R' Inc. If you are looking to use your laptop in a reclined position in bed, an easy chair or the sofa, the Ultra-Lite Laptop Laidback Version 3 is the only product that accommodates a wide range of body sizes, arm lengths, and hand sizes, fitting people with up to a 60" waist line. This flexibility is achieved with a simple, effective adjustment system for angle and height. The unit is a strong, durable and lightweight injection-molded plastic device. At just 2.0" thick, and weighing under 3 lbs, it will support a 22 lbs payload. It is easily packed into a briefcase or knapsack - or carried by its built-in handle. The Laptop Laidback also works with all laptop brands as the front ledge stoppers adjust to provide access to drives, controls and ports on the front edge of the computer case.